Are you ready for this week's big announcement? We're now offering online video classes! WooHoo! Call me over the moon excited! This is a project that we've been working on for weeks and are so glad to finally announce our first class, the Peaceful Handmade Book class, which was created and produced by Donna-Marie Wheaton. Donna-Marie is the newest member of our design team and she will be focused on producing our online classes. I've known Donna-Marie for a number of years, working with her at my local scrapbook store and having her teach at the Stamping Around events, and I am continually blown away by her creativity and attention to detail. I think of her as the MacGyver of crafting...Give her some ribbon, rhinestones, and a stack of paper and she'll produce a completely custom book with hidden pockets, tags, tabs, and more! I'm constantly amazed at what she produces and I know you're going to be thrilled with her classes! For our online classes we will be offering the option to also purchase a class kit so that you can make exactly what is shown on the video. It is not necessary to purchase the kits, and the kits will be limited in supply, but having the kit will enable you to create the same project. If you do not purchase the kit, the materials needed will be explained during the video. 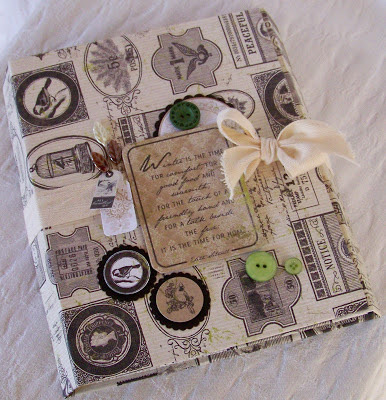 You can then select your own paper and embellishments to make the album that works best for your style or occasion. Our online classes are available for $9.99 and once purchased, are accessible for life. After purchasing, you will receive a welcome letter, which will contain instructions for logging on to our virtual classroom. Once you set up your account you will have access to this class and all future purchased classes. The Peaceful class kits are available for $14.99 and include all the supplies needed to create the project shown in the class. You can even watch a short commercial on the eClassroom page that shows the project in its entirety! All online class offerings and kits can be found on our eClassroom page. Enjoy!! What a fantastic new venture... and that looks a great project to kick it off! This project is just beautiful. The e-class with the option of purchasing the kit or not sounds intriguing. Great idea!